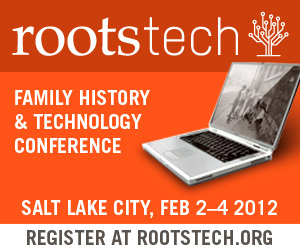 This morning’s Keynote at Rootstech 2012, was from Ancestry.com and was entitled “Making the Most of Technology to Further the Family History Industry.” Although I was unable to attend Rootstech in person this year, I was able to view the keynote online. Ken Chahine has served as Senior Vice President and General Manager for Ancestry DNA, LLC since 2011. Prior to joining us he held several positions, including as Chief Executive Officer of Avigen, a biotechnology company, in the Department of Human Genetics at the University of Utah, and at Parke-Davis Pharmaceuticals (currently Pfizer). Mr. Chahine also teaches a course focused on new venture development, intellectual property, and licensing at the University of Utah’s College of Law. He earned a Ph.D. in Biochemistry from the University of Michigan, a J.D. from the University of Utah College of Law, and a B.A. in Chemistry from Florida State University. During the keynote Dr. Chahine discussed the “revolution in the science of genomics” that many people really don’t appreciate yet. He noted that this revolution is driving all sorts of new products and development. In response to a question from the panel leader about the computational and analytical challenges to autosomal DNA products, Dr. Chahine noted that he has been building a team of computational biologists knowledgeable about DNA that have been creating and refining algorithms to analyze the date and present it in meaningful ways to users. Hearing from Dr. Chahine was extremely interesting, educational, and entertaining. It is clear that Ancestry.com is spending considerable amounts of time and money into their new autosomal DNA offerings. Why would Ancestry.com spend so much time and money getting into the autosomal DNA business? There are at least several important reasons, not the least of which is access to an enormous genealogy-minded consumer database (~1.7 million current subscribers to Ancestry.com, I believe). However, perhaps the single most important reason for Ancestry.com to get into the autosomal DNA business is their almost-unrivaled ability to combine the results of DNA testing with an enormous database of traditional records. Combining the results of autosomal DNA with family trees and paper records is, of course, the future of genetic genealogy. Ancestry.com users have already been combining paper records with their family trees. I, for example, have digitally connected numerous census and other records to individuals within my uploaded family tree. In 2012 we will be able to add autosomal DNA as yet another layer to our family trees. For example, if John Doe and I both have family trees uploaded to Ancestry.com, and our testing reveals that we have shared DNA, we can connect that shared DNA to our shared ancestors. What DNA/genes found today traveled to North America on the Mayflower? Given my known family tree and my autosomal test results, from what ancestral individual in the Ancestry.com database might I have inherited this portion of DNA? Based on the shared DNA of his ancestors, please recreate the genome my great-great-great-great-great grandfather John Doe. It is important to understand that while the amount of both information and computing power necessary for these types of questions is enormous, it will likely be within the ability of the field over the next 5-20 years. Are there any [currently outrageous] questions you can only dream of asking today but think might be answerable in the future using DNA? According to the interface shown in the video, which is likely to be an early version, the test breaks down biogeographical ancestry not only into broad continental categories such as “European” and “African,” but also into regions within those categories. For example, the results shown in the video are 74% African and 20% European. Under the “African” tab, the results show 27% Bamoun, 22% Brong, 13% Yoruba, and 12% Igbo (a total of 74%!). The interface also shows the locations of these groups superimposed on a map of Africa, as well as nodes which appear to represent connections (possibly genetic cousins) in those populations. Clicking on a node, for example, brings up what appears to be a genetic cousin and shows the predicted relationship (here, a 10th cousin), various biographical information (including date of birth), a link to view the individual’s tree, and a contact link. Be sure to following The Genetic Genealogist, and I’ll be sure to share the latest information about Ancestry.com’s Autosomal DNA product with you. Previous Article Does DNA Link 1991 Killing to Colonial-Era Family? If you want to let your imagination run riot, how about sensors in your fingertips which allow you to analyse the DNA of every individual you shake hands with (in the mode of Terminator 3), and the ability to link the data to a worldwide DNA database of all human beings alive (plus any remains of all the dead ones). On second thoughts, it may cross the bounds of taste and decency, plus the privacy lobby may get a little upset. Joking aside, it would be amazing if that series of numbers gleaned from your inner cheek cells could tell you precisely when and where each and every one of your ancestors lived. But then again, it would take away all the fun of guesswork and speculation – and the internet woud be bereft of articles about Hitler’s Jewish ancestry, and Chinese villagers descended from lost Roman soldiers!